Wings of Doom is a 1984 Masters of the Universe children’s book written by John Grant and illustrated by Robin Davies. Here, Skeletor sends wyverns to kidnap Stratos’s wife, and He-Man and company have to save her. I’m not sure whether to award points or deduct them for Grant’s shameless cribbing. At one point, the heroes must traverse an icy mountain range, and so are led through the monster-infested dwarven mines that run through the mountains (spoiler alert: Gandalf dies). Overall, though, this is a readable enough story, and other shenanigans are mostly limited to He-Man shooting beams out of his sword. While not great, Davies’ art isn’t near as bad as it was on 1983’s A Trap for He-Man, but even so, it’s not a good fit for the book – mostly because his style reminds me slightly of Ed Roth’s illustrations, which aren’t exactly kid-friendly. 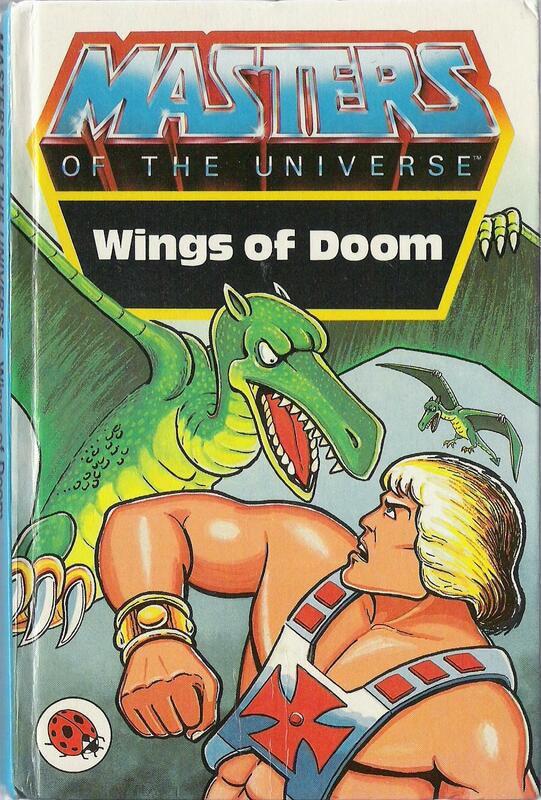 Frankly, Wings of Doom is mediocre in every way.